Investing in a high-quality mop is the best way to keep your floors looking their best. Regular cleaning with the right type of mop can not only keep your home feeling fresh and clean but it can also extend the life of your flooring, allowing you to get the most out of your investment. There are quite a few different types of mops on the market. Learning a little bit more about each of these types of mops can help you determine which style is right for your needs. These mops feature a thick, rectangular-shaped sponge that is attached to a long handle. There is a flat metal or plastic piece attached near the sponge with a shorter handle on it. To wring out the mop, all you do is squeeze this handle inward toward the sponge. The flat part of the handle compresses the sponge and removes any excess water. Sponge mops are ideal for cleaning uneven surfaces such as tile floors. The sponge does a great job of getting down into any grout lines or depressed areas on the floor, allowing you to clean every part of the surface. The only downside to these mops is that they tend to harbor bacteria if they are not properly cleaned between uses. The key to preventing this problem is to rinse them completely after each use. Additionally, they should be stored in an area where they can dry thoroughly. 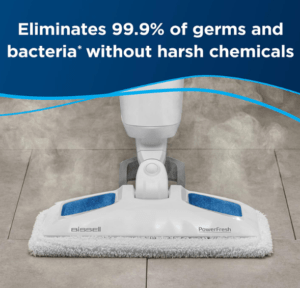 Any moisture that remains in the mop will provide the perfect breeding ground for bacteria. Therefore, every effort should be made to dry the mop out completely between uses. Perhaps the most well-known type of mop is a string mop. For most people, it is the type of mop that instantly comes to mind when they try to imagine what a mop looks like. In essence, it is a series of cotton strings that are all bound together at the top. These strings are attached to a standard size mop handle. Instead of having a ringer on the mop itself, the wringer is usually inside the mop bucket. To remove excess water, all you have to do is place the mop in the wringer and squeeze the handle. These mops are extremely inexpensive and can hold a lot of water. However, they can be somewhat challenging to care for. Cleaning them between mopping sessions usually requires thoroughly washing them to remove any dirt and grime. Additionally, they tend to fall apart and lose strings fairly quickly. That means that you may need to regularly replace your mop head to keep it in tip-top shape. Microfiber mops are extremely similar to string mops. The primary difference is that instead of cotton strings, they have strips of microfiber coming off of the mop head. Not only are these mops highly absorbent but they are also easy to care for. They can be thrown in the washing machine between mopping sessions, allowing you to kill any bacteria that may be lurking in the mop head. These mops are also nonabrasive, which helps eliminate the risk of leaving behind any scratches on your floor. Hopefully, this brief introduction to the different types of wet mops that are currently out there will give you a better idea of the style of mop that will work best for your home. That way, when you are shopping for top-rated mop and bucket sets, you will be able to narrow down your search to only those mops that fit your needs. Here is a closer look at some of the most popular styles of mops. 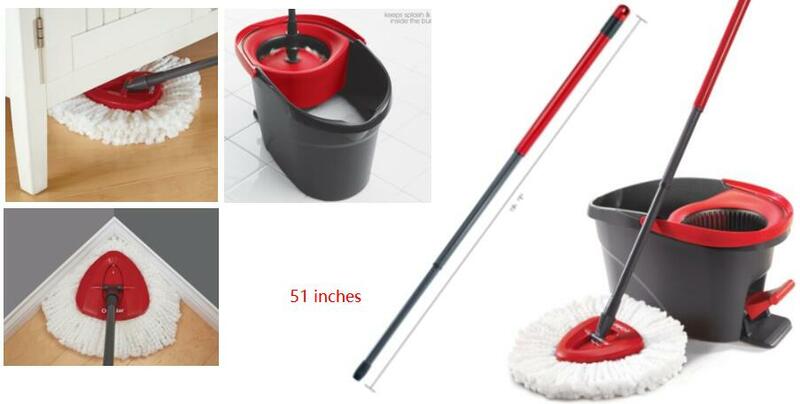 Choose the right designed mop and bucket set will save you lots of time to clean the mop head and wring it dry. All these will help you to clean the floors or windows in short and easy way. Keep this information in mind when shopping for top-rated mop and bucket sets to choose the right set for your home. With 50% stronger handle and now backed with extended Lifetime Warranty for all Amazon customers. NO foot pedal, NO plastic spinning axis, NO other unnecessary moving parts (wheels, agitator) to break or cause leaks. Machine washable mop heads last 6-12 months. Can also be used as dry mop to pick up hair and dust. Swivel joint pivots 180° and rotates 360° to clean under furniture and along baseboards. Patented mop plates make rinsing the mop head easier than any other mop on the market. You don’t have to spend as much energy to get the mop head to spin. The 180* swivel of the mop head makes it easy to reach under furniture, the lock allows you to extend up to clean windows. Save time and clean your floors in half the time. The best, fully loaded spin mop system with stainless steel mop wringer and handle. The lock is awkwardly positioned low, which makes it inconvenient to reach to lock/unlock the handle. Quality backed by our 2-year guarantee and product warranty after registration.